This recipe is pretty straightforward with breading the scaloppini, frying it and then serving it with a sauce. The beauty of it all is capturing the flavors with every step! Starting with good quality veal, (even better if it's free raised, imo), I seasoned the scaloppini with Montreal seasoning. Salt & pepper would do just as well too. Rather than using just plain breadcrumbs, I added some grated Romano cheese. You can flavor your breadcrumbs with your preferred seasonings and spices, such as Italian seasoning. But the lemon cream sauce really adds some bright citrus notes to this whole dish. Both lemon juice and lemon zest are used, along with white wine and chicken broth. The sauce is thickened with a slurry of cornstarch and water so that it had a great consistency to hold it's own against the scaloppini. I served this with buttered egg noodles with fresh herbs. You can also adapt this dish to use with pork or chicken cutlets too. Place the egg in a shallow pan. Combine the breadcrumbs and cheese in another shallow pan. Dip veal into the beaten egg, then press into the bread crumbs. Gently shake off excess, and set aside. Heat olive oil in a large skillet over medium-high heat. Add breaded scaloppini, and cook until golden brown on both sides, and no longer pink on the inside, about 4 minutes per side. Remove to a paper towel lined plate, and keep warm. Pour out all but 1 tablespoon of oil from the skillet followed by the minced garlic. Cook the garlic for about 30 seconds to flavor the oil. Add the lemon juice and white wine, scraping any bits at the bottom of the skillet. Increase heat to high, and bring to a boil. Boil for 1 minute. Dissolve the cornstarch in about 2 tablespoons of chicken broth, and set aside. Pour the remaining chicken broth into the skillet, along with the lemon zest and bring to a boil. Once the sauce is boiling, stir in the dissolved cornstarch, and cook until thickened, about 1 minute. Remove the sauce from the heat, then whisk in heavy cream. 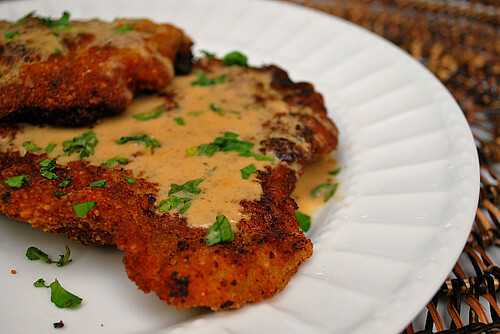 Place the veal on a serving platter, and pour sauce over the top or on the side to serve. Where does the garlic come in? Hi Anonymous - thank you for your question! The minced garlic is added just after pan frying the scallopini. I've added the step within the recipe above. Thanks for asking so I could correct it!